Rajendra Pachauri, the chairman of the Intergovernmental Panel on Climate Change (IPCC), appears to be on a media tour intended to rehabilitate both his own reputation and that of the organization he leads. Yesterday’s article in the UK’s Telegraph may turn out to be one of a series of similar stories (backup link here). Unfortunately, there’s every indication that these accounts will be written by shockingly uninformed journalists who’ll continue to give Pachauri the benefit of the doubt. In this instance journalist Peter Stanford falls for Pachauri’s claim that he’s being targeted in a shoot-the-messenger scenario. According to this narrative, the public doesn’t want to confront the danger of climate change so the person delivering the unwelcome news gets attacked. Oh, please. Pachauri has systematically misled the entire world about how his organization writes its reports. He has insisted that these reports are based only on peer-reviewed literature when this is simply not the case. He has boasted that his organization is utterly transparent – but an InterAcademy Council committee that took a close look at the IPCC last year concluded otherwise – before recommending that Pachauri should step down. Pachauri has said IPCC reports are written by the world’s top scientists when, in fact, many of those involved are 20-something grad students, green activists, and people appointed with an eye to filling “diversity” quotas. I first wrote about Teske a year-and-a-half ago. I pointed out that, when a Greenpeace protest vessel shut down Europe’s largest coal port in 2005, Teske was on board. In 2006 he was described as the “Greenpeace Co-ordinator and scenario analyst” in a Greenpeace report produced in conjunction with the European Photovoltaic Industry Association (a solar power lobby group). 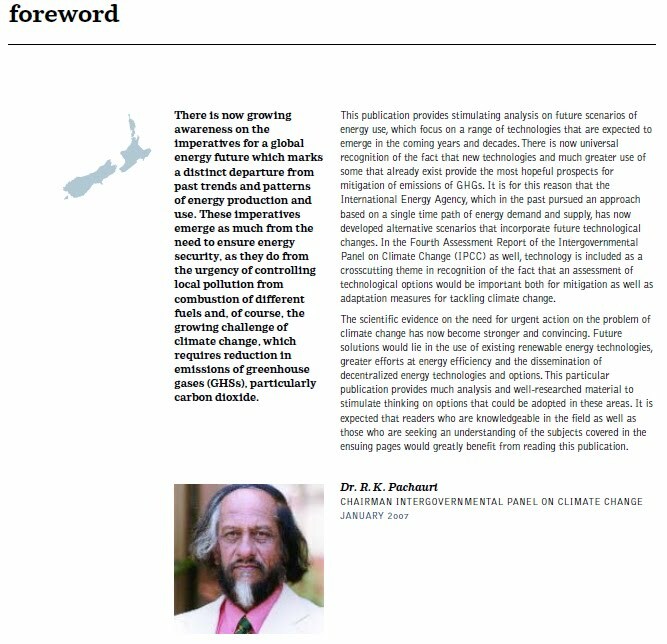 A year later he co-authored another Greenpeace publication titled New Zealand Energy Revolution: How to Prevent Climate Chaos. It features a foreword by (and photograph of) Pachauri. According to a bio that was online in January 2010 but has since disappeared, Teske has a BSc in engineering and a masters in “wind energy technology.” But a bio in this 2009 book makes no mention of a masters degree – although it says Teske has been in the employ of Greenpeace since 1994. 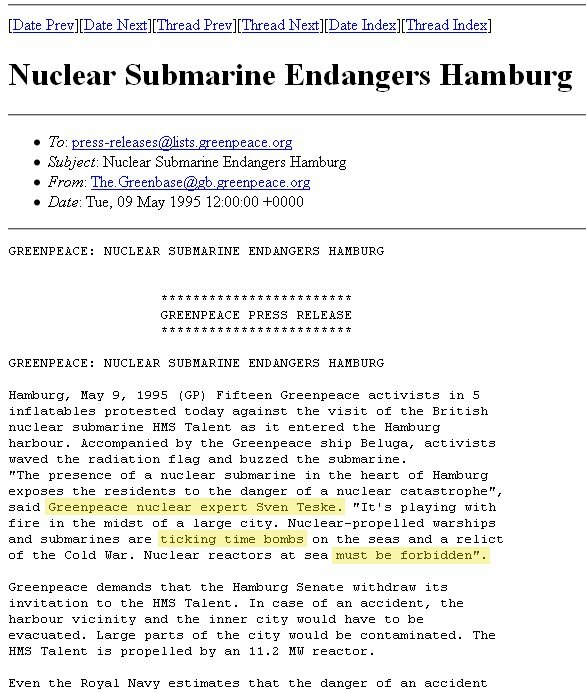 To add to the confusion, a Greenpeace press release from 1995 describes him as a “nuclear expert” (screengrab here). To recap, then: Teske appears to have no more than a Masters degree. He has been a Greenpeace activist and employee for the past 17 years. Depending on which press release you read he is either an expert in renewable energy or on nuclear matters (in the Greenpeace world, these are not the same thing). Perhaps Pachauri and journalist Stanford would care to explain which part of Teske’s CV makes him a distinguished scientist. This entry was posted on July 27, 2011 by Donna Laframboise in climate bible, Greenpeace, IPCC, media, NGOs, Rajendra Pachauri and tagged climate bible, Greenpeace, Intergovernmental Panel on Climate Change, IPCC, Peter Stanford, Rajendra Pachauri, renew, Sven Teske.